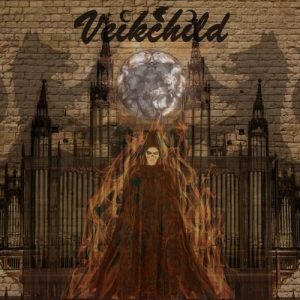 Background/Info: Veikchild is a French music project, which claims to be inspired by bands like Blutengel and Depeche Mode, but also by horror movies, vampires and other creatures from the night. This is the debut work of Veikchild. 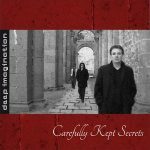 Content: Veikchild clearly sounds inspired by dark themes and you more than once get the impression to hear a sonic interpretation of classical horror themes. The use of organ and harpsichord sounds only accentuates the ‘horror’ style. I don’t really see any possible comparison with Blutengel (except some vampire themes) and Depeche Mode when it comes to the composition. Veikchild clearly strives to compose a dark universe reminding to the good-old and legendary black & white horror movies. Electronics and guitar riffs join hands while there are not a lot of vocals running through the production. + + + : I like this somewhat old-fashioned horror style and especially the typical atmosphere created by the organ playing. It creates a great and haunting ambiance, which is the right work to play on Halloween. “Dark Hellectro Monument” brings nothing innovative, but it’s a pleasant work. – – – : We’re facing a debut work and that’s an element that rapidly comes through. The sound formula is somewhat repetitive and starts to get monotonous after a while. Veikchild also has to inject more vocals into their work except if they want to become a cinematographic formation in the vein of Midnight Syndicate. Conclusion: I can’t say that this is a fully successful debut although Veikchild deals with musical ideas I really like and, which now have to be elaborated in the writing process. Best songs: “Wolf Inside Me”, “Lascivious Vampire”.